Tonight I will share a few beautiful pictures from my day. 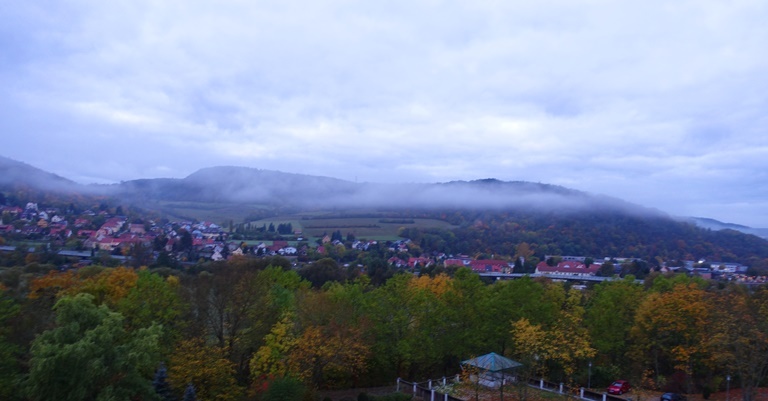 I looked out my window this morning and saw fog floating above the Saale River valley. The air is very humid with all the rain over the last week so I was not surprised to see the fog. As I walked to work this morning I stopped a few times to take pictures of the beautiful fall color. 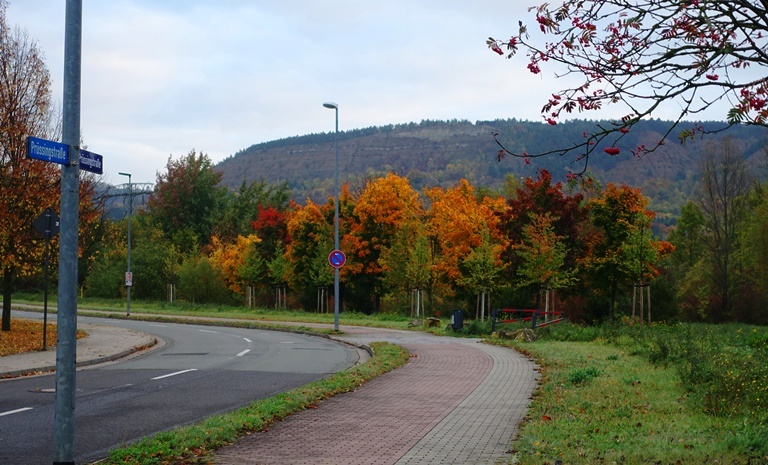 The color of the trees have been rapidly changing in the past week. On the way back to the hotel this evening I stopped on the bridge over the Saale River to take a picture. I really like the reflections in this picture and also the ducks floating in the river. 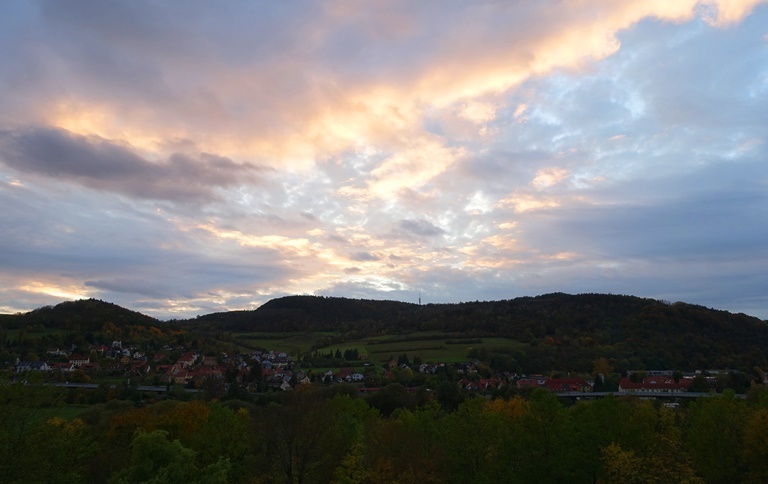 Here is an evening view from my window and you can see that the cloudy sky is very beautiful. 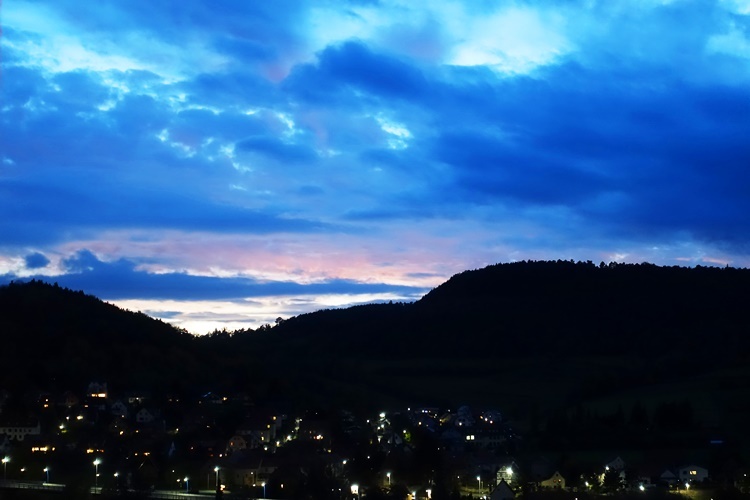 About 40 minutes later the sun had dropped further behind the hills and the valley was immersed in darkness. The clouds look heavy with moisture, and indeed it is forecast to rain overnight. Thankfully, the rain should move out in time for my walk to work tomorrow morning. I also realized that I needed to go eat so headed of to an Old Restaurant for dinner. Click on the link to see what I had for dinner. I hope you enjoyed these beautiful images from my day. 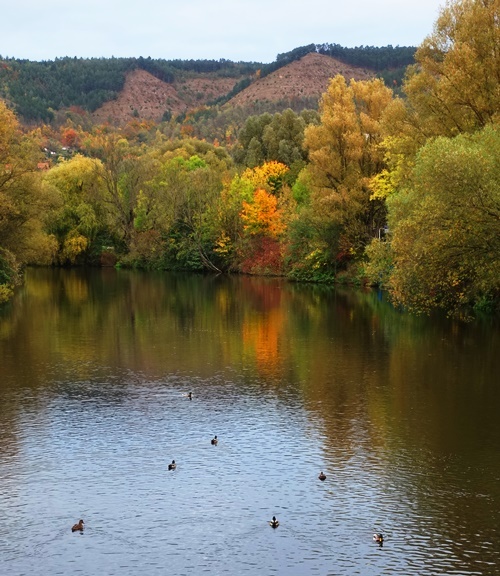 This entry was posted in Germany, Nature, Travel and tagged autumn, Fall, fall color, Fog, jena germany, Rain, Saale River, Thuringia. Bookmark the permalink.